The real estate market today is increasingly competitive. In fact, many would claim it is the most competitive that it has ever been. With a competitive market comes bidding wars, and a lot of them. 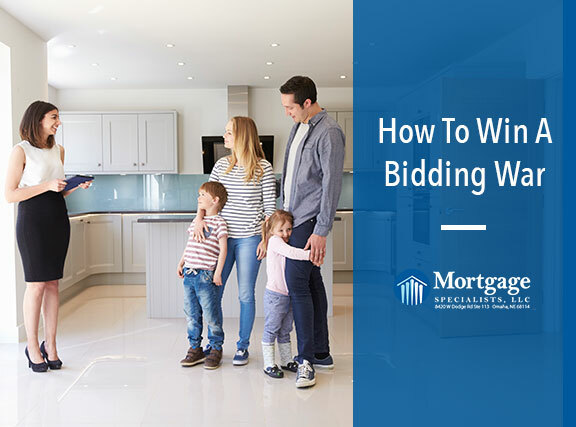 With so many bidding wars taking place, we wanted to take a moment to discuss the best strategies to win a bidding war. If you obtain your pre-approval online, that’s still a great step. But the seller’s agent doesn’t know who did the pre-approval or what guidelines were used. Here at Mortgage Specialists, of all the pre-approvals we have ever given, 99.9% have closed. We have such a high closing rate because we only give someone a pre-approval after verifying all of their documents are accurate. Another great way to win a bidding war is to ask your realtor to inquire what is most important to the seller. In some cases, the price isn’t the most important. Some sellers would prefer to get less money if it means they can close sooner or have found the perfect family to care for their former home. We know we’ve talked about this a lot lately, but it is just that important. Sellers don’t like FHA loans because they’re government-insured loans, meaning they have strict guidelines. For example, if the home is appraised for less than the agreed-upon price, the seller is required to reduce the selling price to match the appraised price. Another major reason sellers don’t like FHA loans is because the guidelines require appraisers to look for certain defects that could pose habitability concerns or health, safety, or security risks. If any defects are found, the seller must repair them prior to the sale. Are you looking to buy a home? Don’t let the market scare you off. Give us a call at (402) 991-5153 to begin the pre-approval process with us today!